The engine has been shamefully sitting around for the last 8 years, I never even cranked it (no big freshwater lakes in VA Beach.) So now I got the urge, drained the fuel tanks, thoroughly flushed out the fuel lines, cleaned and rebuilt the carbs, changed the spark plugs. New battery, 800 CCA, fully charged. Cranked it off, no start. Tried a couple of times. It used to fire right off with no priming, no fast idle lever, no matter what. I tried priming it, pushing in the key, nothing. Looked in the carb intakes, they were all dry as a bone. Manually cracked the primer red lever, fuel came flooding in. It fired right off and ran but, and this is the big but, only ran when I hold the key switch in the start position. As soon as I let off the full right start position, it dies, no run on, sputtering or anything. I verified that the starter was kicking out like it's supposed to, held it in start and let it warm up a little, maybe a minute or so, no change. When running it sounds absolutely beautiful. It does this with the safety lanyard in place or taken off the switch. Gauges light up and system check is run when key is turned to on. I pulled the key switch out and disconnected it so that I can check continuity across the terminals. 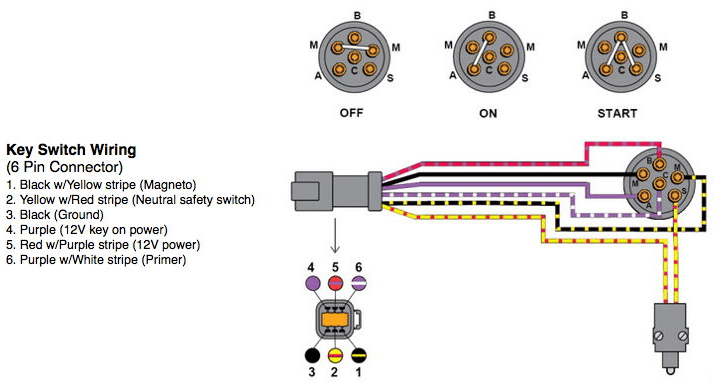 From everything I gathered on the internets, the safety stop grounding should happen in the black/ yellow wire, but the OMC manual has the black to black yellow terminals as the on/ off function. I verified this with the meter, it operates correctly, with or without the safety engaged. I put the meter ground lead on the black/ yellow terminal and checked all of the other terminals, with the safety lanyard both on and off, nothing showed continuity. This should be obvious that the safety switch no longer works but before I toss $50 at a new switch, I would like to know which terminals are involved in the safety stop circuit. OMC has nothing in the manual other than on/ off and the primer. Does anyone have a wiring diagram for the switch? That model switch is spring loaded, the lanyard when removed should turn the key to off. It(lanyard) is not connected to the kill wiring. It running with key held in start sounds like power coil(org wires) on stator no working. Black ground wire from powerhead ground to powerpack. Powerpack Black/Yellow wire to "Raised M Terminal" of ignition switch. Ignition switch "Regular M Terminal" to ground. Key in OFF position === M Terminals connected = No ignition. Key in ON position ==== M Terminals NOT connected = Ignition engaged. Key in START position = M Terminals NOT connected = Ignition engaged. It appears (possibly) that your ignition switch "M" terminals are shorted in the ON position... If so, replace it. Also... Check that with the Fuel Primer Solenoid in the automatic position (facing the opposite end of the solenoid) that the solenoid has 12v applied to it and clicks when the ignition key is in the ON and also the START position... and pressed IN. Make sure that the ignition switch is wired properly... one error could be quite expensive. As I posted you have a mechanical ignition switch. The center sticks out slightly and the lanyard holds the extended portion in. When lanyard is removed with key in on position the key will turn to off. It has nothing to do with the blk/yellow wires internally of the switch.Hold the key in "start" position keeps 12V applied to pack thru solenoid, if power coil on stator is not functioning it not supply power to pack when engine is running. Last edited by Faztbullet; February 6th, 2019, 03:31 PM. I did verify what Fatzbullet says, the lanyard is mechanical, not electrical. Pull it off and the key rotates to off. It looks like the power coil on the stator is bad, how do I check this? I also checked the primer circuit on the keyswitch, now that I know which wire it is, I get no continuity with the key pushed in or not. That explains why I had to manually prime it and also means I get to replace the keyswitch anyway. I stand corrected.... Mechanical switch huh? Disregard post reply #4.However, it makes me wonder why the electrical switch, which must be operated mechanically/manually, and has functioned successfully since day one of the electric start entry to the marine line, was "upgraded" in the first place.No matter... will stick from day one to 1991 only in the future. Ignition switch M-M--Off ./..A-B--On-/-A-B-S--Start--A-B-S-C--Start with primer on. Bullet... You're saying that the mechanical switch you spoke of was only used for a three (3) year period? If so, what did they use in the year 2000 to the present time? The mechanical switch was mainly used on dash mounted ignition and some remotes, the 2000 and up use the standard switch with separate kill lanyard as this was when DFI was becoming of age.